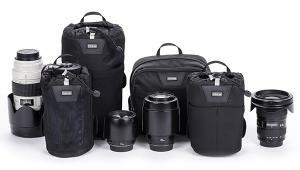 It’s that time of year when fickle photographers everywhere relegate last year’s gadget bag to the closet—or worse—and take up a new way to tote their camera gear. I’m not criticizing—I’m right in there with you. Some favorites endure throughout the seasons, sure, but many are jilted for something new. Here, in alphabetical order, are three companies that offer multiple good reasons to upgrade. Founded in 2010 by a couple of musicians (Dan Maravilla and Trent Valladares) Hex appeared on the scene like gangbusters. I wrote about the original Hex DSLR Backpack as one of the best photo backpacks that $200 could buy. 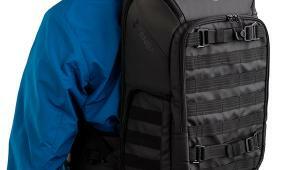 This spring they are upping the ante with the Ranger DSLR Backpack which will be in stores soon. 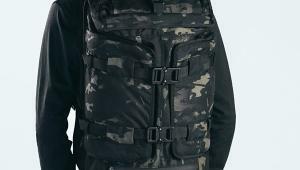 The Hex Ranger DSLR Backpack comes in basic black or the dark, subdued M90 blue/green camo pattern shown here. In keeping with the feature I found most desirable in the earlier model, the Ranger is flatter than most packs and fits on your back more like a Band-Aid than a sack of potatoes. Available in obligatory black and racy M90 blue/green camo, the Ranger retails for $195. The exterior is drawn from ballistic nylon, heavyweight 1080 D (as in Denier, a number indicating the linear mass density of fibers). 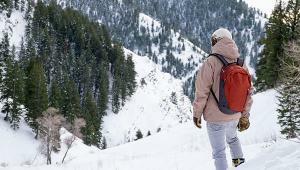 Unlike some backpacks that open from the back, the Ranger opens from the front and exposes a network of repositionable dividers made of EVA foam. 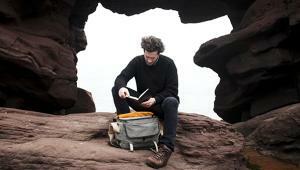 There is also a fleece-lined laptop compartment that accommodates a 15-incher. Zippers are YKK and there is a cleverly hidden slip pouch that holds the included raincover. Other nice touches include tripod lashes on the bottom, a luggage handle (wheelies) pass-through on back and Molle-compatible straps on one side. You may remember me drooling about the Tenba Cooper luxury bags when they first appeared a couple years back (review here). Well, the new additions move the fervor even further along. 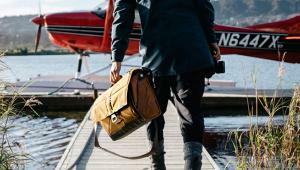 There are two new Tenba Cooper photo backpacks, a downsized shoulder bag and a stylish messenger-style laptop bag. 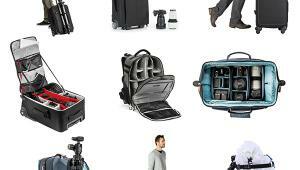 Priced at $99 for the Cooper 6, $279.95 for the Cooper 15 Slim, $199 for the Cooper Slim Backpack and $229 for the Cooper DSLR Backpack all feature that handmade look and ooze luxury—at an affordable price. 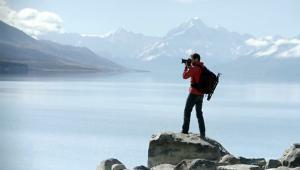 The Cooper DSLR Backpack is the star. It’s crafted from Cordura canvas and waterproof leather and fitted with hand-riveted zipper pulls (YKK zippers, of course). Sized to stow a 10-inch tablet, the backpack features a pull-out camera insert that holds a mirrorless plus up to five lenses or a DSLR with up to three lenses including a 70-200mm f/2.8. The bottom is waterproof full grain leather and the interior offers silicone-coated, water-repellent ripstop nylon and soft, brushed tricot. 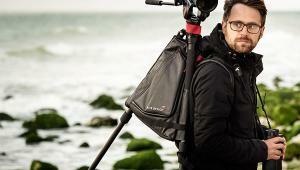 The Tenba Cooper DSLR Backpack features a highly practical pull-out camera cradle. Almost as cool, the Cooper 15 Slim Messenger Bag fits a laptop up to 15-inches and also features a pull-out camera insert. Overall, it shares nearly all of the finer points of the backpack in a convenient form that easily doubles as an everyday business bag. The Cooper 6 is very similar to the Cooper 8 we reviewed previously but doesn’t have the front cover flap (or the pair of pockets and zippered pouches covered by the flap) and is a hair smaller. The exterior dimensions of the Cooper 8 are 11 x 7.5 x 5 inches, whereas the slightly smaller Cooper 6 specs out at 9.75 x 6.5 x 4.5 inches. Price of the new Cooper 6 is nicer, too ($99 vs. $169). If you don’t need the flap and the front pouches, the top-access Cooper 6 is a great deal at less than a hundred bucks. You’ve gotta hand it to the gang at Think Tank—it seems like they are always coming up with something new and terrific. Today’s news is the StoryTeller collection, a group of three sturdy bags that embody all of the engineering excellence we’ve come to expect from Think Tank. Here’s a preview peek at the Think Tank Modular Belt System V3.0 which we will review in depth soon. If you just can’t wait, the new modular items are available for sale on Think Tank’s website now. Not be forgotten, they’ve also updated their Modular Belt System to Version 3.0. You can read about it here for now; we are planning a full Bag Man review in the near future. In this writer’s opinion, belt systems are grossly overlooked and underused, so we’ll have full, rich details to report soon. 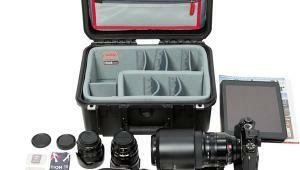 The StoryTeller 5 holds one DSLR or mirrorless, up to three lenses and an iPad Mini. It retails for $64. 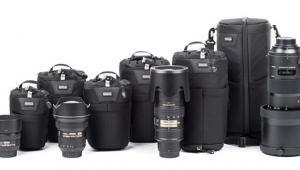 The StoryTeller 8 fits up to four lenses (70-200 f/2.8 included) and a 10-inch tablet. MSRP is $69. The larger StoryTeller 10 accommodates up to four lenses, a 10-inch tablet and a system such as this: Nikon D850 with a 24‒70mm f/2.8 attached, 70‒200mm f/2.8, 85mm f/1.8 and an iPad. Cost runs $84. 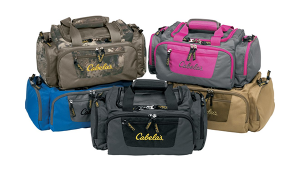 All models feature YKK zippers, adjustable padded shoulder straps, seam-sealed raincovers and multiple pockets and pouches. All fabric exterior is treated with a DWR (Durable Water Repellent) coating and the fabric underside is coated with polyurethane for greater water resistance. That tax refund check isn’t going to help the economy if you don’t spend it. Need more reasons to buy a new bag? How about this one: it’s been a long, cold winter, and you deserve it.